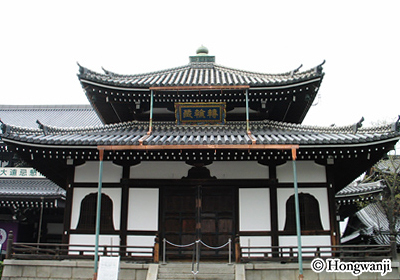 This main worship hall rebuilt in 1760 has been designated as a National Treasure. Its dimensions are 45 x 42m and stands 25m tall. In the central altar is a wooden image of Amida Buddha, flanked by portraits of six of the Seven Pure Land Masters: Nagarjuna and Vasubandhu (India), T'an-luan, Tao-ch'o and Shan-tao (China); and Genshin (Japan). In the side alcoves are portraits of Shinran's direct teacher Honen (left) and one of the first patrons of Japanese Buddhism, Prince Shotoku (right). 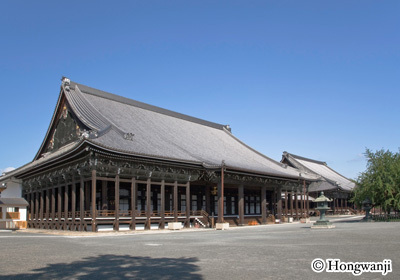 Rebuilt in 1636, it has been designated as a National Treasure. Its dimensions are 62 x 48m with a height of 29m. A wooden image of Shinran Shonin, the founder of the Jodo Shinshu teaching, is enshrined in the central altar. 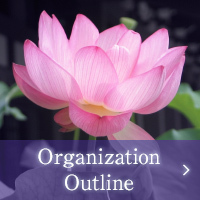 The position of Monshu, Head Priest of our religious organization has been assumed by successors in the founder's lineage. Portraits of successive Head Priests are displayed along the sides of Shinran's image. Major observances conducted at Hongwanji are largely conducted here in the Founder's Hall. 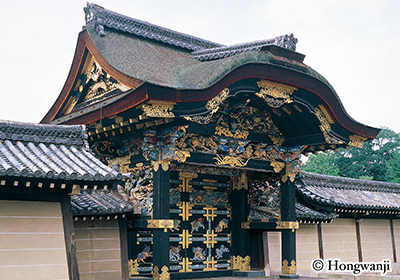 Recognized as a National Treasure, this four-pillared gate protected by a cypress-thatched Chinese-style gable is known as the Karamon (lit., "Chinese gate.") and is also known as the "All day gate" saying that one could lose track of time and spend an entire day admiring its lavish decorative carvings. Made applying characteristics from late 16th C Japanese architecture, some say that it was once part of the former Fushimi Momoyama Castle. Designated as an Important Cultural Asset in 2014, this scripture vault built in 1678, contains the entire collection of the Daizokyo Tenkai Edition of Buddhist texts, which is named after Tenkai, a monk of the Tendai sect who compiled the texts over a period of 12 years beginning in 1635. 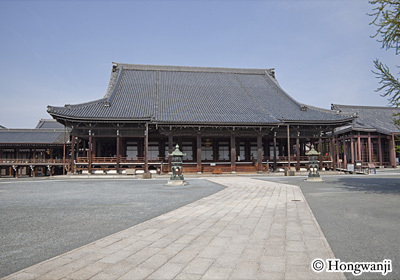 Hongwanji then purchased the collection in 1648 from the Tokugawa government for approximately 100 kilograms of silver during the tenure of Hongwanji's 13th Head Priest, Ryonyo. 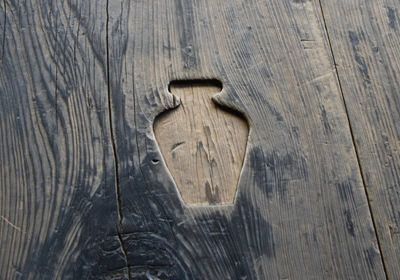 During the Edo period, the drum contained in the structure was struck signifying the time of day. 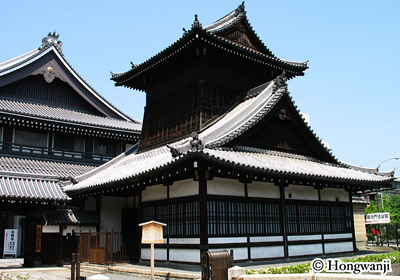 This multiple-storied building situated in the north-eastern corner of the Hongwanji precinct is believed to have once been used by Shinsengumi, the armed police force organized by feudal government at the end of the Edo period. Since 2014, the Drum Tower has been recognized as an Important Cultural Asset. 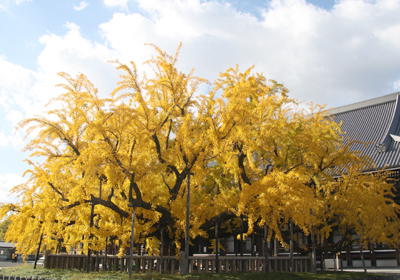 Estimated to be more than 400 years old, this splendid tree has been designated as a Natural Monument by Kyoto city. With its branches appearing as though they are roots spreading up into the sky, it is sometimes referred to as an "upside-down ginkgo." Legend also has it that the tree spouted out water in attempting to save the temple halls from catching on fire that it is also called "the water-spraying ginkgo. The corridors that stretch out from and bridge between the two religious halls have a variety of wooden plugs covering knotholes and cracks on the planks' surface. Many of them were made into various shapes including animals, flowers, things related to nature, and numerous forms related to Japanese culture such as hammers and fans by the carpenters who engaged in the repair work. During your visit to Hongwanji, please enjoy locating some of carvings and appreciate the playful imagination of the carpenters.